The summer storm threatened to fall all day. As the evening came the skies lightened and we were graced with a brilliant sunset splashed across Lake Constance. Franz and I were thrilled because we had tickets to the Bregenzer Festspiele in our city of Bregenz, Austria. 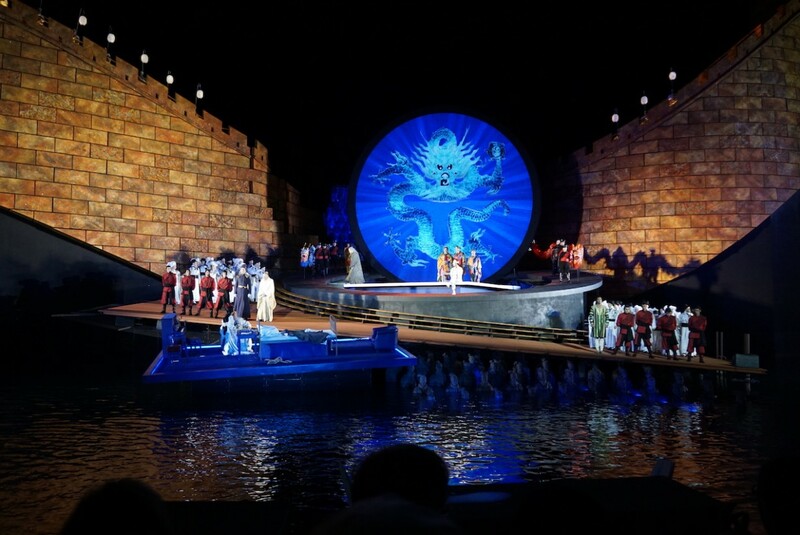 This years lavish opera was Giacomo Puccini’s Turandot. The story set in China is of the Princess Turandot who had enthralled many princely suitors. To win her hand they had to solve three riddles but if failed they were beheaded. The Prince Calaf falls for the Princess and solves the riddles but she refuses him. He then offers that if she can find out his name by morning he will die but if not she will his betrothed. The dramatic narrative combined with the light rain only added to the flowing beauty of the vocal performances and the Viennese Symphonic Orchestra who played to perfection on the floating stage. The opera performers were spectacular and the highlight of the evening, the aria Nessum dormas was met with much applause. The stage setting and lighting with the backdrop of the great wall of China complete with oversized terra cotta soldiers and Chinese lanterns adorning the moving platform was breathtaking. The costume design was lavish as well as were all aspects of the production from the fire jugglers and martial artists to the stellar acrobatics and dragons. What a wonderful operatic evening we had. I can’t wait until next year’s staging of Georges Bizet’s Carmen.